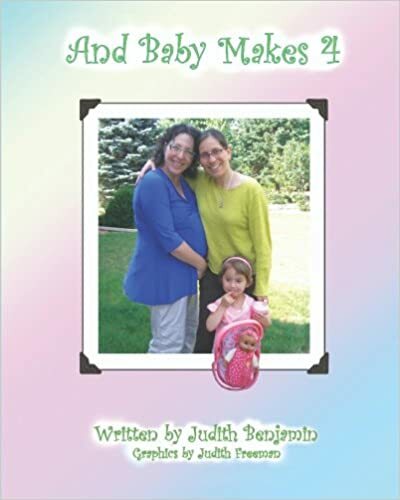 And Baby Makes Four, written by Judith Benjamin with photographic images by Judith Freedman, was published in 2009 by Motek Press. Lesbian moms and their young daughter prepare to welcome a new baby into their family. The story is told in the first-person from the point-of-view of the couple’s young daughter. At the beginning of the short book, the young girl learns her mom is pregnant and that she will be a big sister. Pictures of her pregnant mother as well as ultrasound images show what the story tells. Once her parents bring the new baby home, she begins to adjust to the cute but loud and attention-hogging new infant. This adjustment isn’t seamless. She has to get used to the good and not-so-good of being a big sister. By the end of the brief book she has settled into her new life and enjoys her role in the family. This is a good story to help young children process a new addition to their home! It is well-paced and accessible, helping children as young as three begin to grasp the changes that will occur. I do not like the use of personal photographs in books. It feels too intimate; a reminder that you are clearly reading someone else’s story. I prefer the abstraction of illustrations because it makes it easier for readers to “step into” a story, so to speak. However, And Baby Makes Four does fill a niche and can be a useful aid to discussing the addition of new siblings.